Chester Ault was a lifelong member of the Woodsfield congregation, having served at one time as one of our shepherds. Since 1986, Chester has been making annual trips to India to preach the Gospel. Through Chester, God has allowed thousands of lost souls an opportunity to hear about His Son and to become obedient to Him. Sadly, Chester passed away in May 2016. On 01-03-2015, one soul obeyed the gospel of Christ, her name is Ruth. Kindly pray for the new born baby growth. Good news I wish to share with you. I and Brother DV Daniel often visit in Thaadoor village I preached Jesus and His gospel to this village people. Today I travelled to Thiruthani Velanjery village for teaching to the two souls from Thaadoor Mrs. Rosy and Miss. Nagamma. Brother Sudhaakar brought them to the Velanjery village to teach them the way of salvation and about baptism into Jesus Christ. I taught them clearly and they accepted the gospel and wish to obey and I baptized them into Jesus Christ. Here I attach those pictures. Please go through them and I request you to pray for these new babes in Christ Jesus our Lord. 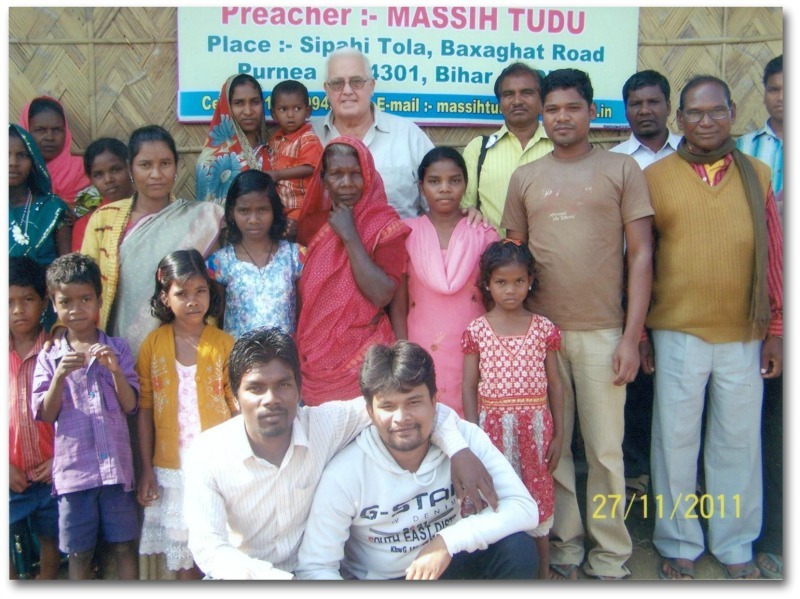 On December 2, 2012 the church in Sullurpeta, India added 3 souls to Christ. Please pray for them. Back in June 2012, we had put the donation tree in the foyer and asked you to purchase 2 pairs of flip-flops for each person. The drive was to help the orphans and widows at the Mission Vision Orphanage. Mission Vision is the orphanage that Chester helps in India. See the results of our drive below. Thanks to everyone who contributed. Left: The package arrives. Center: Display of flip-flops. Right: Massih Tudu with the children.